IT’s not often that I pick up a book and get a new favorite writer. But that’s pretty close to what happened when a story collection called Homesick For Another World, by a young author I’d not heard of, arrived in the mail one day. I read a few dark, alienated short stories, some of which were set in a dreary, bleached-out, dingbat-lined Los Angeles. I found a noirish novella called Eileen, and devoured its grim Patricia Highsmith-like tale in record time. My Year of Rest and Relaxation, comes out. It’s in some ways different from the novella — the plot is more minimal, or at least more internal, as it mostly concerns a character trying to spend a year in a New York apartment doing just about nothing at all. But the combination of bitterness, bleak humor and writerly control is identical. A few weeks ago, I met Moshfegh — who grew up outside Boston but now lives in Hollywood and the high desert — for a coffee. I was struck yb a few things, including her early interest in what she called “black male” writers like James Baldwin, Richard Wright and Ralph Ellison, in part for their sense of internal exile. 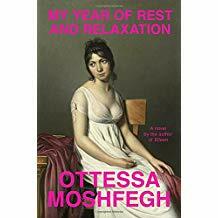 In any case, my brief profile of her is not yet online — I will post it if it comes up — but here is a review of her latest by Dwight Garner in the New York Times. She’s not always an easy read, but she’s the real thing for sure.